The Bitterroot River has the most consistent and longest dry fly season of all our western freestones. The skwala stonefly hatch offers hopper sized dry fly fishing as early as the first week in March! The Bitterroot is a mid sized river that pleasantly splits the Sapphire and Bitterroot Mountain ranges with incredible views of large jagged granite peaks as the back drop while you cast to wild trout. This large fluvial river basin has many side channels, spring up-wellings, and log jams, providing anglers with all the characteristics of a great trout river. You can pitch attractor patterns to pocket and riffle water on the upper reaches or target a crafty rainbow sipping small mayflies in the flats on the lower. 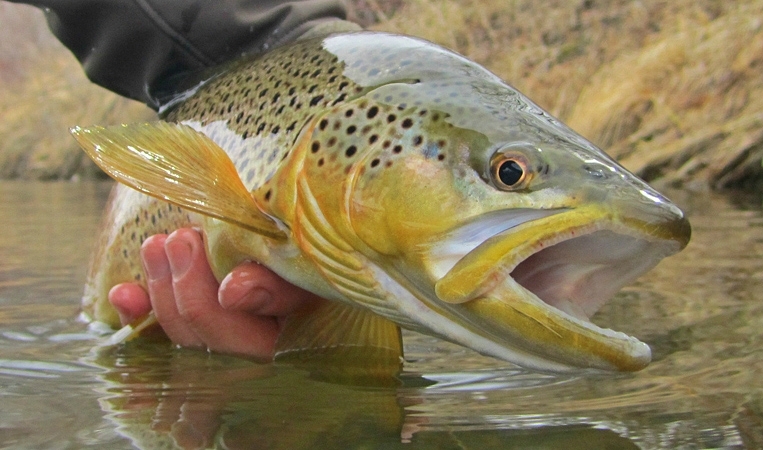 The Root bolsters one of Montana’s best trout and insect populations. It is arguably one of the the best dry fly rivers in the country. Unfortunately, irrigation and drought conditions can make the fishing challenging in mid summer. Depending on the water year, we normally enjoy fishing this river in the spring and fall when the crowds are fewer and water conditions are more conducive to productive fishing. The upper river above Hamilton, is a bit swifter and smaller in character with the majority of the trout population being cutthroat. This section generally provides the most action with eager cutthroat that are willing to eat attractor dry flies. Mid river has a more equal distribution of cutthroat, rainbow, and brown trout. This section also has the most diverse habitat with classic deep holes, long riffled runs, lots of side channels and log jams that give the trout plenty of places to hold. The lower river begins to slow and widen a bit with long slow runs and classic out side hopper banks. These slow flats can have exceptional mayfly fishing with pods of Rainbows and cuttbows sipping steadily during blanket mayfly events. The fishing generally is the easiest on the upper river and becomes more technically challenging as you make your way to Missoula. This river is a true bug factory with great hatches of stones, mayflies, and caddis. It is not uncommon to have several hatches overlapping at any given time. There are often days you can throw a size 18 may fly and a size 6 foam attractor with success in the same day. We typically like to dry fly or dry dropper fish on this river and often encounter a window of insect activity that provides several hours of good dry fly fishing. You will find rainbow, brown, cutthroat, and the occasional brook trout throughout the drainage. The upper reaches tend to produce more cutthroat and smaller average size while the lower has more hard fighting bows and a bit larger fish. Fish average 14-18″ but opportunities for 20″+ fish are common along with the occasional 2 footer.